Sub title for this post: The Dress The Thrift Store Built. Sub-Sub title for this post: The Most Hand Sewing I Have Ever Done, lol. 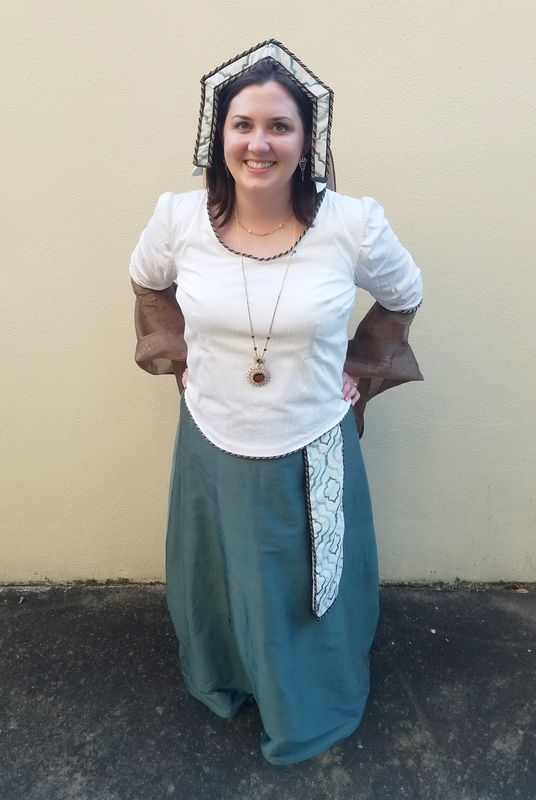 So, here is my finished costume :) Just slightly more medieval looking than my first post, eh? So, after my first post about the base top and skirt, I did a little embellishing :) In a very fortuitous thrift store run, I found this brown floral printed poly organza material. 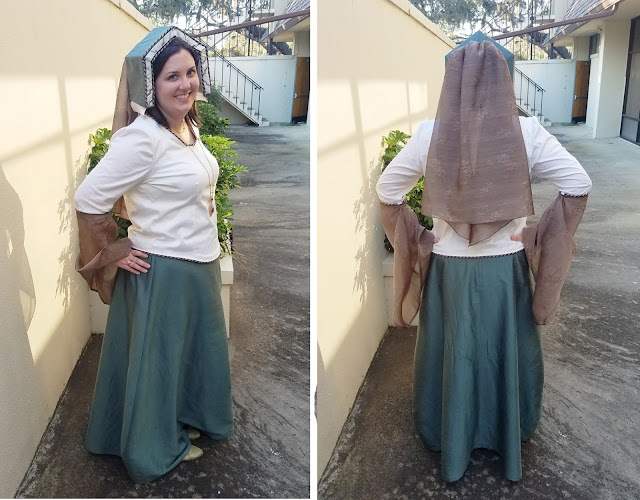 It was completely random - I had already made the top and skirt, and I knew I wanted long, drapey sleeves, but I still was trying to figure out what fabric to use. Then I found this stuff. Fate! Finding this fabric also solved my other problem of what type of trim to use. I had a 10 yard bundle of the brown twisted upholstery piping that I had bought from The Sewing Studio during one of their sales intending to use it on a bench. Happily I still have enough left over for that if I want to make it someday :) But because the floral organza was brown, I went with the brown piping. Yay for everything coordinating! Since I was adding the piping after the top was complete, I hand sewed the piping to the neckline and hem. The insides aren't as perfectly lovely as they were, but no one will see them but me. I had to do two lines of stitching to try and get the piping to lay flat at the neck, and it's still a bit wavy, but not enough to bug me. I kept telling myself, "It's a costume." 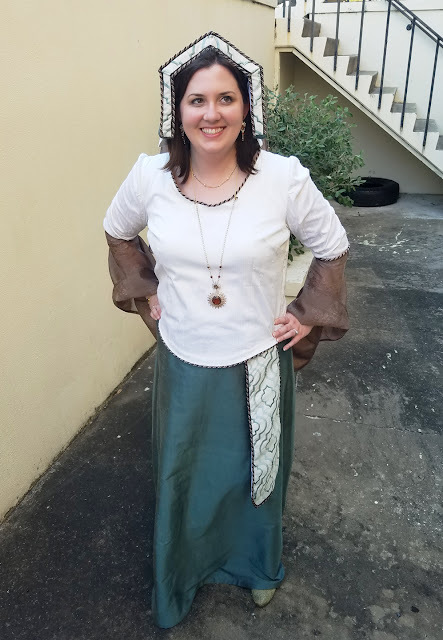 The sleeves were self drafted ... after I looked in the pattern booklet of a McCall's pattern with a drapey sleeve I liked, lol. Once I saw what the piece was shaped like, I just freehand cut my own. 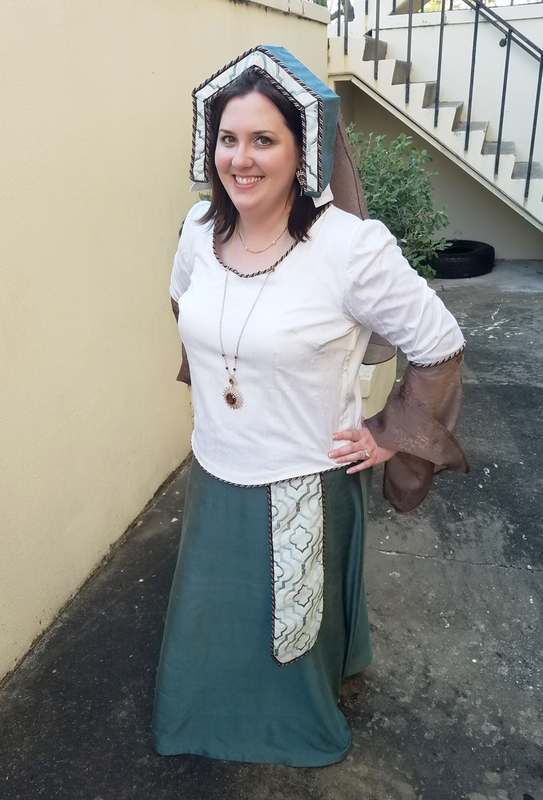 I made sure the top was the same width as my sleeves so they would line up, then did a circular curve down to the bottom hem. Since this is totally sheer, I french seamed the curved seam. Since the silk sleeve was already finished, I went ahead and finished this sleeve too before attaching them. I double turned the hem and top stitched at the top and bottom. I decided to add piping where the sleeves connect as well, which was ridiculously complicated, lol, mainly because everything was finished and there was no place to hide the end of my piping. Luckily there is so much going on right at my elbow that you don't notice the back of the piping through the sheer fabric at all. I deliberately made the sleeves to cover my hands, then I rolled them back at my wrist for added drama. The sleeves were fun until I needed to reach across the table while eating, lol. I also broke out some shoes I've irrationally held onto for years yet never wear, lol. They are a more grass green color, but they are brocade and have little jewels at the top :) They worked great. Not that anyone saw them in my floor length skirt, but you can see a little peak in this photo. Everyone's costumes looked so good! 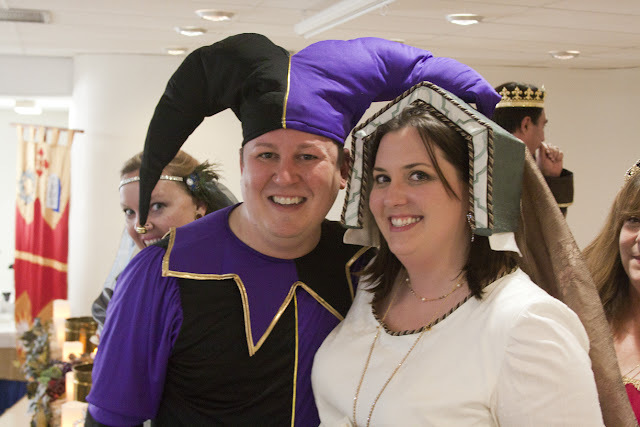 And happily I didn't feel like I stuck out as the girl with a box on her head, lol. 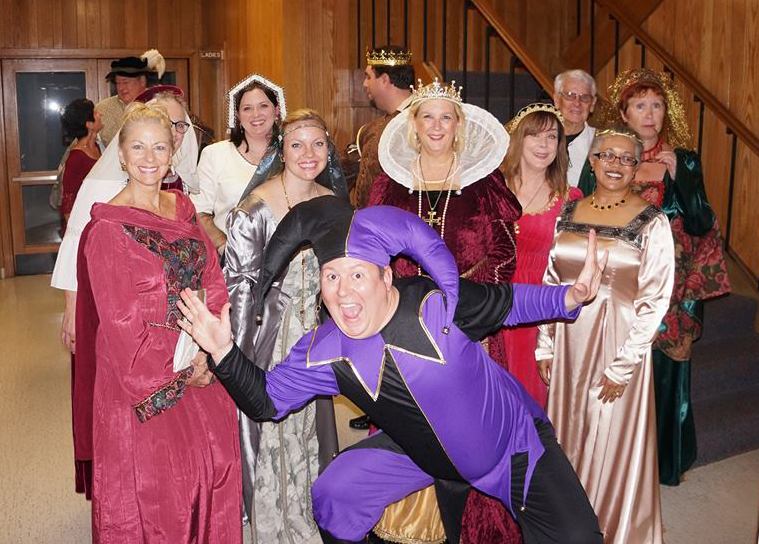 Our whole group sat on the stage as the "Royal Court of King Mario", while the "peasants" sat at tables on the main floor. When we came in, we mingled as we walked forward, then we had toasts and sang a bit, then we had dinner. Dinner was followed by our singing performances. 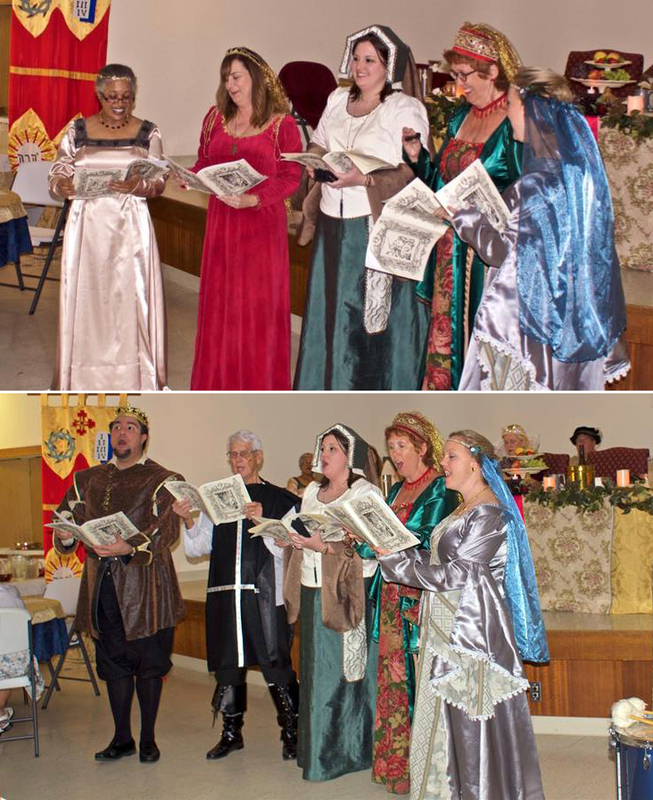 The top picture was Soliloquy while performing (usually we have 2 more ladies, but they couldn't make it this time). Soliloquy sang The Lark in the Morn and Nightengale, The Organ of Delight (which is the best title ever, lol). The bottom picture is Broadstreet, and we sang April Is In My Mistress' Face and Fire, Fire In My Heart. This was before we went out and started. Walter definitely had a lot of energy. lol. Ok, so I have to pause and give amazing cred to Mario for his mad sewing skills. 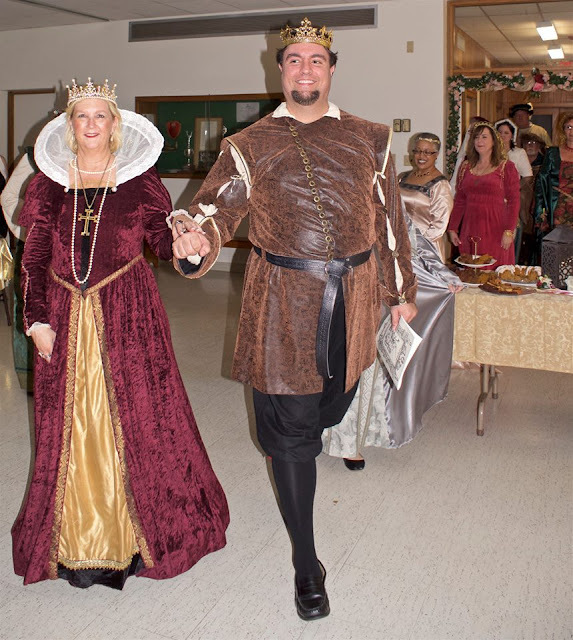 Not only did he make several dresses and tunics for others, he also made his whole costume. Look at that jacket! Isn't is fantastic?! Me and Walter with a little creepy Peggy photobomb, lol. Walter and I went to high school together, so it's really funny to do things together now. Oh how life ends up, right? 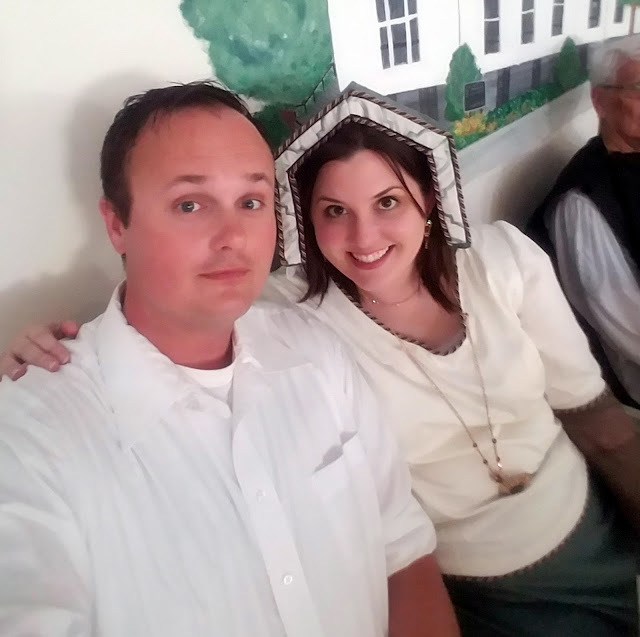 Chillin' with my honey on the side lines after we sang :) This is our first performance he's been able to attend, so it was nice having him there. So that was my first experience with a madrigal feast :) In spite of the hectic sewing and planning I've done over the last month on this project, it was really nice to see everything come together. 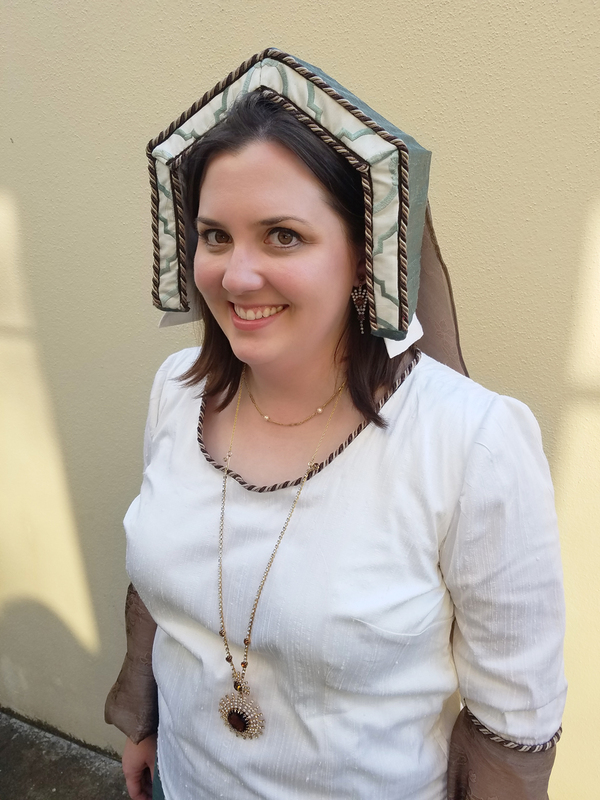 In spite of my initial reservations on my hat, I really enjoyed having it with my costume and I felt it tied everything in. I felt very put together, and I got a lot of compliments. 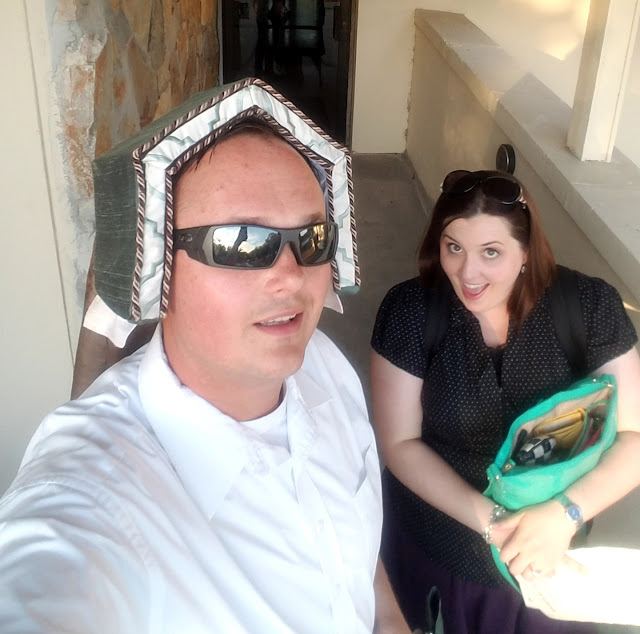 We had some fun comments too - like since we were singing songs about birds I made a bird house for my head, lol. All in good fun. I'm pretty proud of this whole costume, and now I am ready if I ever want to go to a renaissance fair or something, lol. Woo hoo! I had no idea what my final total was until posting this, and I'm pretty proud that I was able to make something like this for less than $30 :) Yay for being cheap and thrifting! This was a fun project, but I'm hoping I don't have to make any other costumes for a while, lol.